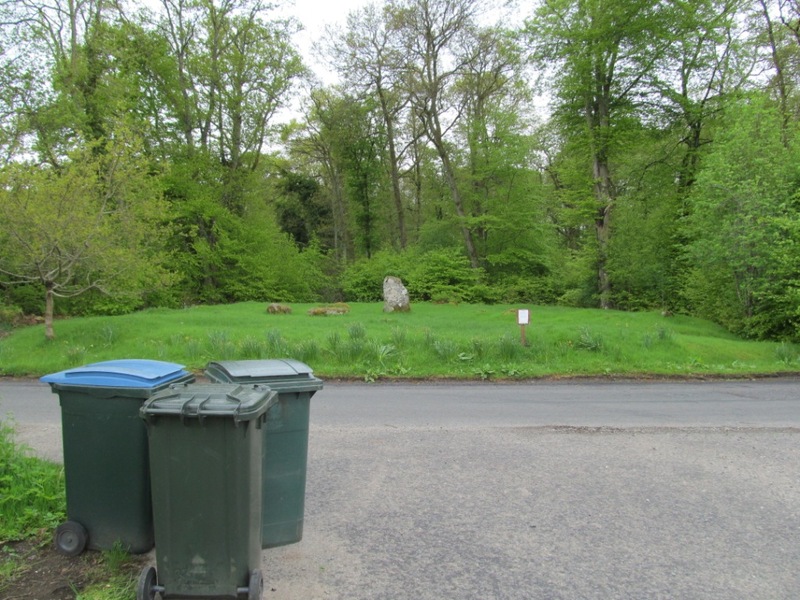 On the edge of the Perthshire village of Comrie, sandwiched between a row of houses and a cemetery, is a rather sorry looking set of stumpy stones, one of which is still standing, which go by the rather grand name of the Roundel (one of several names this site has as we shall see). It is a monument that has obviously declined (even in the last few decades), yet like all urban prehistory it still has a story to tell, which concludes with the identification of a surprising international twin. Known also in Gaelic as Dunmhoid (Dunvoid) or the judgement mound, this is one of two such “four poster” monuments in the country and the only one containing a cist burial. It is a Scheduled Ancient Monument and protected under the 1979 Act, with the scheduling also including the surrounding land. It is neither access to the private woodland nor a footpath. As it is being damaged by foot traffic, please do not use it as such. There is a public footpath through the woods some 40 yards to the west. Please use this for access and respect and protect this unique monument and burial place. I am not sure who the author of this rather pompous sign is, but it reveals little about the monument itself, and offers more questions than answers. For the casual visitor may well ask themselves: what on earth is a ‘four poster’? Normally, it means an extravagant bed found in fancy hotels and stately homes with curtains that both conceal the sleeping form within, but also could conspire to be a trip hazard (or a shield from ghostly visitors as in most Scrooge films). But not in prehistoric archaeology. In this very specific context, a four-poster (the hyphen is optional) means a square setting of four standing stones with each ‘post’ marking the corner of the square. In other words, square stone circles. Stone squares. Strange now I come to think of it. I am puzzled by the assertion that there are only two such “four poster” monuments in the country – a quick search in CANMORE reveals there are 53 such monuments in Scotland, over half of which are in Perth and Kinross. A few of these are cropmarks, and may well have been timber post structures, but most are ‘four poster stone circles’ which usually means Bronze Age, certainly ceremonial, possibly burial, and definitely geometrically not a circle. The form of the monument today makes it very difficult to make sense of, more of a one-poster than four-poster, with one angled grey monolith standing to waist height, and a few fallen stones scattered around it. The site as a whole sits on a low flat-topped mound (possibly why it also has a tradition of being called a ‘court hill’) which has a low, intermittent line of small stones around the top of the mound. But the site looked slightly more coherent even as late as the 1940s. The most detailed archaeological account of this monument was based on a visit on 19th August 1942 by the legendary archaeologist V Gordon Childe. What was Childe doing in this corner of Perthshire, and why was he recording this particular monument? 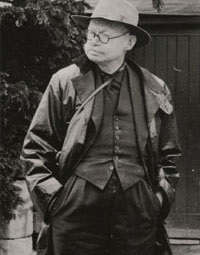 He was working as part of a programme of Emergency Surveys carried out by the Royal Commission on the Ancient and Historic Monuments of Scotland, survey work carried out during the Second World War primarily by Childe, and Angus Graham, who was secretary of RCAHMS at the time. The war brought special risks to ancient monuments in all parts of Scotland, not only through enemy action but through field-training of troops, and we endeavored to forestall such damage by preparing emergency records. Under this programme some two thousand three hundred photographs were taken of buildings situated in counties not yet covered by Inventories, and six hundred and thirty-six monuments were visited by and recorded in military training areas. We have to thank Professor Childe, who was then a member of the Commission, for having done on the bulk of this later work himself. Much of the survey was undertaken in areas that RCAHMS had not previously worked, for even by the middle years of the centuries full and detailed inventories had only been prepared for a fraction of the country. The survey was recognition of the vulnerability of archaeological sites and monuments to warfare, invasion and accidental damage (the monumental equivalent of friendly fire). This is at a time when people would have been forgiven for having more pressing matters to attend to, and so we should be thankful that all contingencies of the impact of total war were taken into consideration for the benefit of future generations. It also benefited future archaeological fieldworkers, because thanks to the hard work of Childe and others it was ensured that future inventories had some content already prepared, and some notable research successes were also recorded, such as Childe’s identification of Neolithic burial monuments in the Black Isle. Childe’s description of this monument suggests it was in a better state then than now. Here he records that two stones were standing when he visited, and a further two fallen stones were present. And he suggests that the low mound upon which the monument is situated is ‘modern’ although exactly what this means, I’m not sure. Earlier accounts of the monument suggest that it has had a chequered history in terms of appearance. 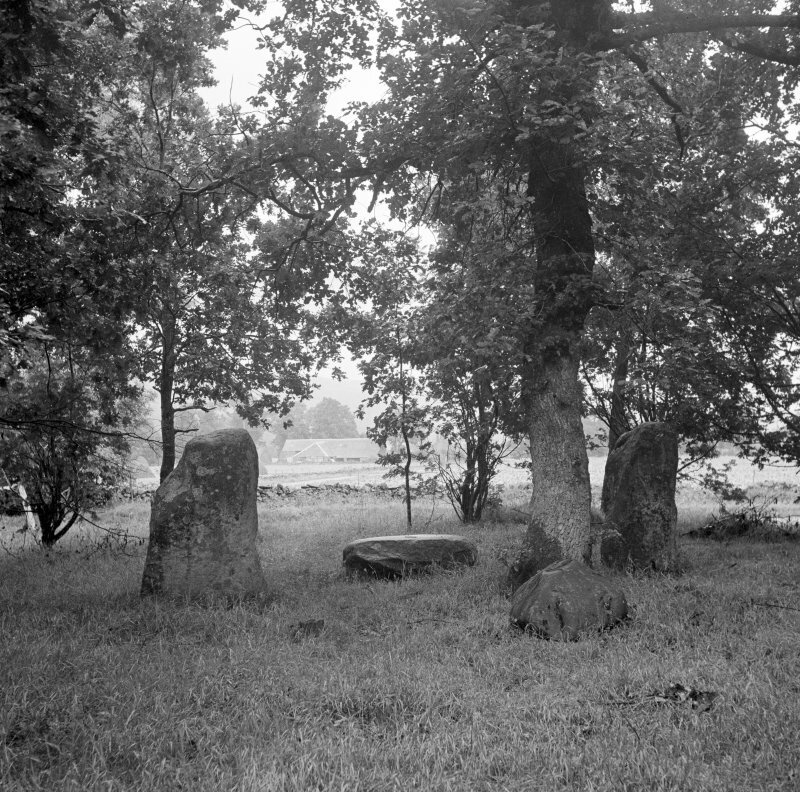 An account in the Chronicles of Strathearn by Rev John MacPherson in the late 19th century for instance notes that three fallen stones were erected in 1876 (to make the total of standing stones three or four is unclear). Prehistoric burials are suggested by accounts of both a cist, containing a human thigh bone, as well as a cremation urn, being found ‘within living memory’. Whatever inaccuracies of detail there may be [in the MacPherson account] we may at least take it that four Stones originally composed the Circle here, and that the interior was devoted to purposes of sepulture. Little else is known about this monument, other than in the time between Childe’s emergency visit, and an Ordnance Survey map revision in 1966, one of the remaining two stones had fallen over again, perhaps struck by a falling feather. 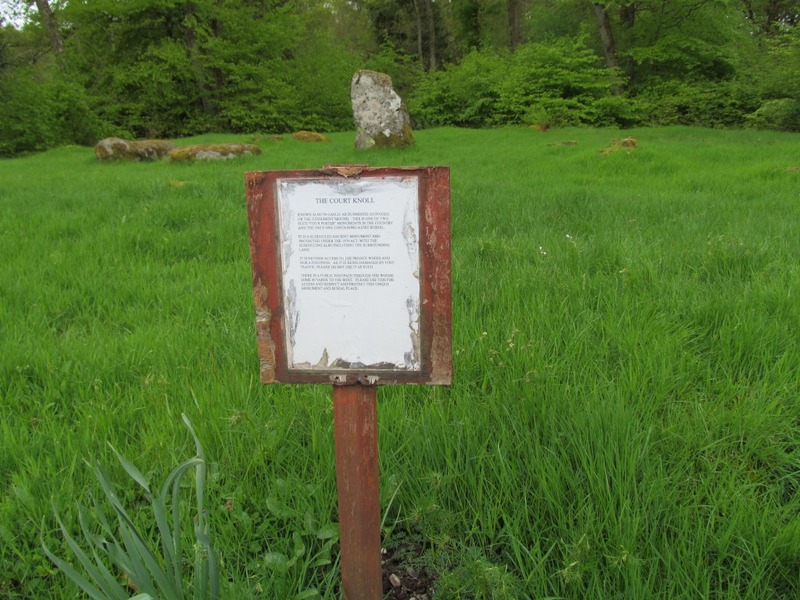 And so when I visited the site last year, only one single standing stone remained, and it appears thankfully that no further efforts by the people of Comrie, masons or otherwise, have been made to re-erect any of the fallen stones, or even have a poke around. And now it sits in a little woodland glade, on the roadside, separated from a big cemetery by a wall, guarded by the urban furniture of the ‘Welcome to Comrie’ road sign and the rather less welcoming sign asking visitors to consider walking around the monument, not over the top of it, to get to the trees beyond. The day I visited, bins were set out on the roadside, presumably poised for collection. This reinforced the sense that this monument sits (literally) on the edgelands of town, a liminal zone between Comrie and not-Comrie, between life and death, on a fork in the road. No doubt in prehistory this was also a liminal place, a gateway of a different kind, perhaps an entry point to another world and a location for rites and rituals. If local people use this square circle for similar activities nowadays, presumably they deposit their materials into one of the nearby wheely bins, not specially prepared pits and stone sockets. 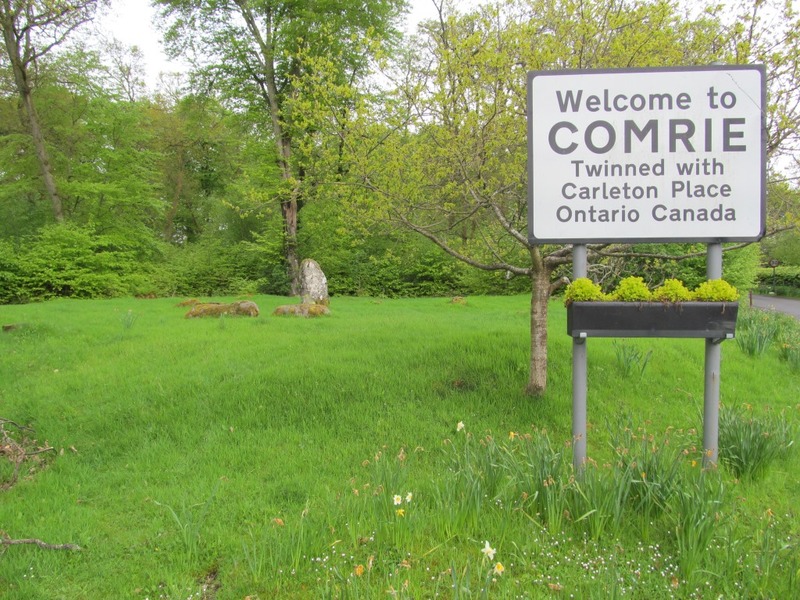 By way of footnote, I couldn’t resist checking out Carleton Place in Ontario, Canada, the place Comrie is ‘twinned with’. Imagine my amazement when I found out they too have a standing stone, albeit of much more recent heritage. A stocky yellowish orange megalith stands at the entrance to the Carleton Community Labyrinth. This feature is an ongoing community project, centred on a labyrinth marked out in big concentric circles on the ground, part of a community garden. 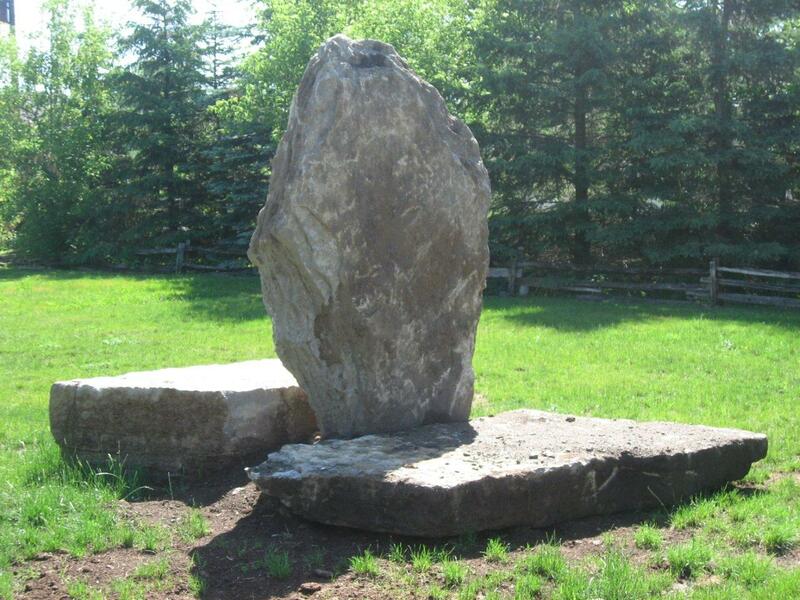 The standing stone was a later addition (erected in 2010), a striking entrance feature to the labyrinth. 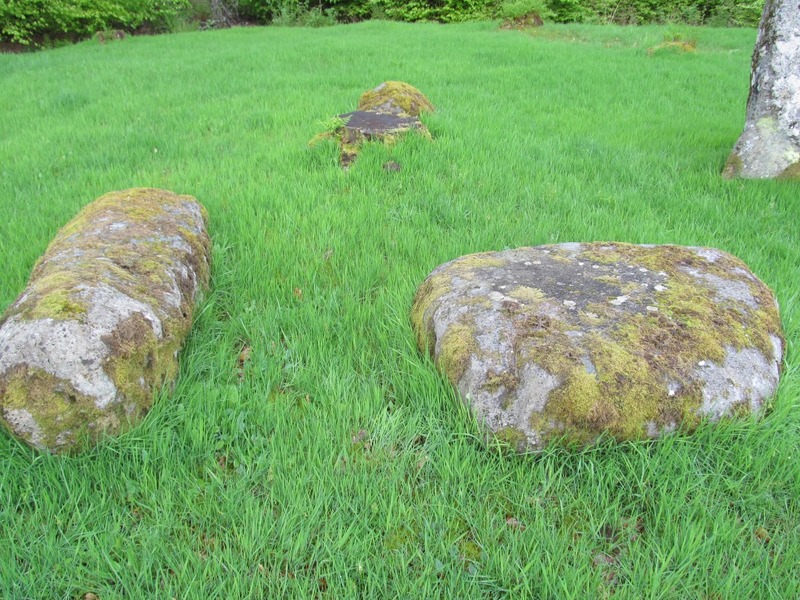 But what is perhaps most spooky of all is that this megalithic feature consists of a single standing stone flanked by two recumbent stones – a twin for the Comrie megalith. A twin for the roundel? 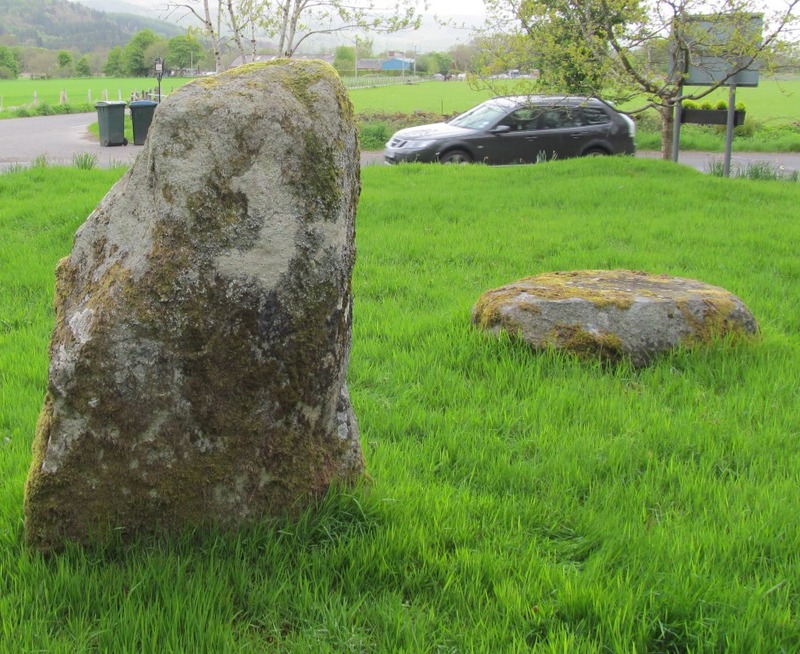 It would be nice if the inhabitants of these two towns could get together and celebrate their standing stones and lying down stones – and to marvel at the coincidence generated by their twinning. 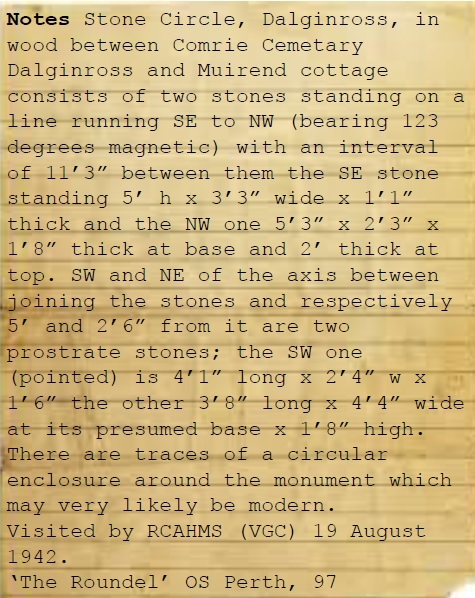 Sources and acknowledgements: the main source of information for this monument, and the Emergency Survey data, is the site’s CANMORE entry (NMRS number NN72SE 6). Cole’s account of the monument, and the line drawing, were sourced from his 1911 article ‘Report on stone circles in Perthshire, principally Strathearn; with measured plans and drawings’ in the Proceedings of the Society of Antiquaries of Scotland volume 45, pages 46-116. The photo of the monument in 1942 was taken by Gordon Childe, and held in RCAHMS collections, archive number SC 1436181. 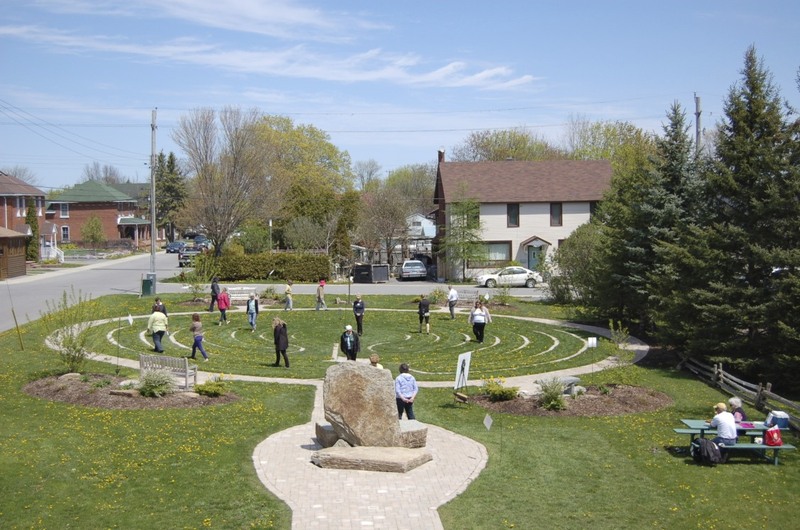 Images and information about the Carleton Community Labyrinth and standing stone came from that project’s blog, link in the post. The photo of Childe is available widely online.